Thursday, 3.30pm: A major road project in Peterborough will now cost an extra £4.5 million to complete after problems were uncovered just months before completion was due. Cash-strapped Peterborough City Council, which is seeking to bridge a £25.2 million budget deficit, will need the money to counter problems discovered during the widening of Fletton Parkway. The £12 million project, which started in February 2014, will see the A1139 Fletton Parkway widened from two to three lanes in each direction between junction 1 and junction 2 (Goldhay Way/Malborne Way roundabout). The project is due to finish in the spring of this year. But now a number of issues including the rare discovery of an extensive amount of soil contamination under the road has left the local authority facing a hefty bill. Council chiefs say the contamination may date back many years but say the soil must now be removed. But unforeseen repairs to drainage and the hard shoulder have also added to the costs. The original cost of widening the parkway was raised from £11 million to £12 million in February last year. The costs are being partly covered by a government grant of £4.5 million plus a further £4.8 million from ‘third parties’ involved in the development of the 5,350 Great Haddon housing scheme nearby. A further £2.2 million was being contributed by the council. A report for the council’s cabinet with full details on the additional costs for the project will be published tomorrow (Friday January 22). It is not yet known if the scheme will encounter any delays as a result. Leader of the Peterborough Independents, Councillor David Harrington, could not understand why the contamination had not been detected much earlier. He said: “I find it hard believe this was not picked up at an earlier stage. There must have been surveys done at the start of the scheme. “I would hope now we get a full investigation. Cllr Harrington also called for councillors to have more chance to scrutinise future schemes before they are signed off by the council’s cabinet. He added: “We rely on officers to make the right decision but it does not always seem that those decisions are in the public interest. Simon Machen, the council’s director of growth and regeneration, said: “The additional costs to complete the Fletton Parkway widening scheme are disappointing, however they are completely unavoidable and could not have been predicted. “Fletton Parkway is a main route into and through our city and is therefore a key part of the regional road network. “If the city continues to grow at the rate it is, attracting new businesses and investment, it is absolutely critical that this road can cope with an increasing level of traffic. “Since the widening scheme commenced a number of significant issues have occurred which have resulted in an estimated increased cost of £4.502m. “These issues will not lead to a delay in completing the scheme. “The issues include the discovery of extensive amounts of contaminated soil which is virtually unheard of in the road construction industry and could not have been predicted. “We presume this contaminated soil dates back to when the road was originally constructed and may have been related to the brick manufacturing industry, when environmental considerations relating to soil and material use were far less strict. “Removal of this soil has cost us £45 per cubic metre because it is contaminated, as opposed to the usual £9.80 per cubic metre, incurring a total additional cost of £1.38million. “In addition, the existing drainage is in far worse condition than we expected which has resulted in the need for extensive repair work costing £928,000. “Additional costs are also associated with the repairing of cracks identified in the hard shoulder caused by the age of the road and the protection of Great Crested Newts. Mr Machen added: “We have submitted a bid to the Department for Transport to fund some of this additional work. ”In addition, we plan to transfer money from existing growth and public realm budgets, so that there is no impact on the council’s overall budget. 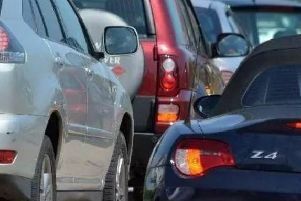 “The Fletton Parkway carries a huge level of traffic every day and as a result would have required major maintenance in the next few years costing in the region of £9million. Rather than incurring that cost we have secured significant external funding to both repair and widen the road. £11m plans to create major junction and widen Fletton Parkway approved, 27 March 2013. Bill for major Fletton Parkway project goes up by £1m, 20 February 2014.